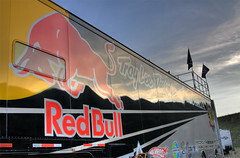 As I was getting ready to leave the 2008 AMA Supermoto Championships, I spotted the Troy Lee Designs/Redbull race rig and wanted to grab a few shots. At first I didn’t intend on setting up for an HDR or getting the sunset in the reflection but I impulsively set the camera for a bracketed shot and did this one hand-held. We wanted to get to the car and get out of there before the rest of the crowd! I was very surprised how well this one lined up during processing since it wasn’t taken on my tripod. Click on the pic to see it larger on my Flickr page. This entry was posted on Friday, November 21st, 2008 at 12:34 am	and is filed under Blog, Photos. You can follow any responses to this entry through the RSS 2.0 feed.